The Canadian Broadcasting Corporation recently issued a DVD collection of all the television performances recorded for them by Glenn Gould. From the early years, there is a recording of Gould rehearsing Bach Partita #2 - he's working on the articulation in a left hand passage. Gould plays with a precision of intent, looking for not just the overall downward sweep of the gesture, but also some intricate patterning within. He is surrounded by his dogs, and the practice session is taking place in a cabin . Gould leaves the piano and stares out the window, continuing to mutter the rhythm of the music. His hands are contorted, conducting, performing, extracting something from the air. Bach is a convenient medium for the ideas he is examining, just as the piano is a convenient instrument for expressing them in sound. I'd go further and say that Gould is tapping in to some sonic experience which has Glenn Gould as it's most convenient avenue for expression. Gould is ensorcelled. No wonder he has his dogs around, they are atavistic companions to ensure a safe return. It makes me think of Carl Ruggles Sun-Treader. Ruggles also had an unrestrained, magnificent relationship to counterpoint and the title for his symphony comes from Robert Browning describing Shelley --"Sun-treader--life and light be thine for ever." We don't think of Gould as a romantic pianist, but that's because of the repertoire he preferred. His approach to sound belongs with Shelley, although Gould wasn't one for jumping on the roof or sailing in home made boats. The interface for all that are these fingers. Gould sat low at the piano, using a 14 inch stool his father made for him as a boy and which he used for the rest of his life. Who knows what really this allowed. Certainly the leverage on the hands would be affected. The physical act of playing is more important to me than the sound created. In part no doubt because my damaged hearing interferes with the one, I'm never sure exactly what I'm hearing any more. But the haptic sense of a piece has always been important. My teacher, Natash Chances, had been a student of Cortot. I practiced the Cortot exercises as a student. The exercises begin with each finger holding down a key so as each progressively complicated pattern is played, the non-active fingers stay sunk in the keys. Gould practiced 'Finger Tapping' exercises developed by his teacher (Guerrero). The music was played slowly, hands separately, and with the non-active hand tapping the fingers of the hand under examination. None of this prevents a delicate tone. I'm speaking of the root for the pianistic movement. The hands take all that energy, channel into specific articulation, from whatever the source, Sitting so low, Gould would be pulling the keys in towards him. Francis Poulenc wrote a Sonata for two pianos, published in 1953 - the two piano sonata is an enormous and magnificent piece, which should not be mistaken for an earlier Sonata for 4 hands (on one piano). There’s a beautiful repertoire of early 20th century French music for two pianos. Ravel wrote Mother Goose. Debussy has some Antique stuff. Faure (a little earlier) wrote Dolly. I played a lot of it as a younger person, and I remember the experience with great fondness. It's easy to pass over Poulenc in a discussion of structure and theory - anything so lush, so melodic with such a coquettish promise must surely have been pulled from a cognac-fuelled improvisation. This would be doing a disservice to the composer, and to the listener who is transported by the music. The Oboe sonata is as meticulously ordered around pitch class as anything written by the contemporary Stravinsky, and the two piano sonata offers many opportunities for reflection - some prurient, some intellectual, others in a place that questions the line between the two. The same kind of writing ends the piece, but it is ‘scored’ differently. ( ‘Scored’ refers to which notes are played by which hand, taken from the act of writing a musical score). It's curious to me why Poulenc would have done that. 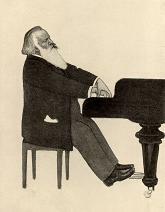 In the first movement, there are huge leaps by each hand of each pianist. In the final movement, one pianist plays notes in a central part of the keyboard, while the other plays a series of chords across the keyboard. Sounds the same, written quite differently. Perhaps what Poulenc has done is to score the composition so that the musicians have to move in a particular way? Perhaps in addition to the actual notes on the page, Poulenc is interested in the relationship of the pianists hands to each other, to the other pianist across the stage, and to the audience. Perhaps he is: I certainly am. Consider the layout of the pianos on the stage. These pictures is taken from a film recording of Poulenc playing his concerto for two pianos...unfortunately, there’s no full stage shot available, neither could I find a film of the actual sonata. But this gets across the visual layout of the pianos on stage. This is a standard arrangement, with the curves of two grand pianos pressed together - like the Newfoundland coast and western Europe in geological text books on tectonic shift. The first relationship to expose is between the players and their pianos. ￼￼If each note is assigned a number, with the lowest key on the piano being zero, and the highest being 87, then I can create a chart that shows the relative position of each hand in each beat of the music. The x-axis is time, represented as each quarter note beat in the piece. The y axis shows the number of each pitch. This is the perspective of someone suspended from the ceiling above each pianist - it is a mirror image, where the lowest note on Piano 1 is directly across from the highest note on Piano 2. When one hand moves up, the other moves down on each respective keyboard. Consider what the positioning of the pianos on stage does to the pianist’s hands in relation to the audience. From the perspective of the audience, the hands closest to us are moving in parallel...as one jumps away, the other follows. My thought is that this visual relationship is as important to the interpretation of the piece as the actual notes being played. One way to make this relationship clearer is if I revisit the chart of lines representing note values, but do some quick math so that instead of a fixed value on the keyboard, each note is assigned a value in relation to the audience. For the pianist on the left, I subtract the key position from 88, to get a value of distance to and from the audience. Zero on piano 1 is the highest note: zero for Piano 2 is the lowest note. This chart shows only the hands closest to the audience. From the pianist perspective, in relation to the keys, even in relation to what we hear, the two musicians are playing opposites. But to the visual perception, the pianists are moving as if joined by a bar connecting their chests across the pianos. As one leans right, two leans left to follow. The pianists are moving together towards and away from the audience. Two marionettes whose bodies lean and shiver in tandem over the two opposing keyboards. This is a pretty piece of choreography. Along These Lines (score || mp3 downloads) is a string quartet written to be performed as part of an exhibition of paintings from The Quiet Axis, by Lowry Burgess , on display at the Carnegie Museum of Art in Pittsburgh between November 2007 and March 2008. The four paintings on exhibit are representations of key visionary seeds that later manifest in an ongoing series of pieces that have been created with precise astronomical and geomantic references. The first piece, The Inclined Galactic Light Pond (1968 – 1974) was created in the Bamiyan Desert in Afghanistan. The Utopic Vessel (1974 – 1979) exists off the shore of Easter Island. A third piece, The Boundless Cubic Lunar Aperture (1980 – 1995) was sent into space on the shuttle Discovery. The Boundless Cubic Lunar Aperture is a formed by holographic plates – each carved with poetic text. After returning to Earth, the object has been magnetically suspended in a rock mass overlooking Sandy Pond, Massachusetts (near Walden). The trajectory of these pieces into zero gravity creates a physical release that mirrors the release of human form and consciousness. Perhaps one way of looking at the paintings is as terrestrial sketches, initial response to a vision that goes on to inform work across four decades. They are all large paintings, sixteen feet tall on the gallery wall and they do induce a different set of thoughtsand unique reactions as a viewer wanders in. When the exhibition came about, Lowry was very clear that he wanted to use the space for lectures and events while the paintings were on the display. The evening of March 6, 2008 was the culmination of several such evenings. I wrote this quartet; Lowry's daughter Vashti wrote a choral work. I included an electronic meditation on Tibetan bells; and we all collaborated on the piece that became I See the Earth,performed later in the Spring at NASA Ames in collaboration with astronauts on board the International Space Station. Thanks to Jonathan Minard for the photo documentation of the string quartet performance, shown here beneath the paintings. The players are from Carnegie Mellon University, the Starling Quartet. Their playing was exceptional, commitment extraordinary. One of the paintings shows the Bamiyan Buddha, an ancient statue from the earliest days of Himalayan Buddhism since destroyed by the samsaric thought of a few suffering/suffered Taliban. The viewer is actually floating above the statue, looking down towards a point where beams of light from the Buddha's hand meet. This vortex suggested a shape. Let me use more ambiguous language. In my imagining, I felt a shape unfold. An intuition, or arising vision in response to the vision/visionary work before us. Without attempting to understand or define this experience, or to question what may be behind the vortex, I resolved to consider this sensation while writing a piece of music for the evening. The craft of composition is to tackle the challenge of context. An initial impulse carries great meaning, but that impulse is 'heard' in relationship to myriad other thoughts – musical or otherwise. Much of composition is extracting that essential and assumed framework and presenting it so that the original impulse can be experienced in the complete way. A gesture written in response to the penetrating vision of a vortex is a sketch without framework. What is this framework? Marvin Minsky writes that we are “entranced” with our emotions. These are the thoughts that etch themselves onto a blank page. The web of meaning and memory can be contextualized in a composed piece by juxtaposition with other material, maybe by some contrapuntal working, by formalist alignment or perhaps by the unfolding of various processes. This last is the economy of meaning that I use in this string quartet. An idea is wrapped within a mechanical process. My aesthetic response to the startling vision in the Bamiyan Buddha painting includes a sense of emotional distance, the transformational awe, a certain New England transcendentalism. A very clear imperative to capture a geometric shape held between the hands of this Buddha (whose statue is no longer there). How does this piece really interact with the paintings? I have been asked this question a couple of times. Aren't I an opportunistic composer? All I can say is that I wrote a string quartet surrounded by these images, immersed in a conversation about a transformational axis. Of course those ideas wrapped their fibrous being around my thoughts. Equally of course within that web I am writing my own music. Is this inter/intra/cross disciplinary? I don't know. Lowry 'heard' some of the images, was inspired by specific chords. I 'see' the shapes of the music. So cross disciplinary in practice really means multiple understandings of events across senses. Not disciplines, but senses. And underneath it all is the fact that I love both the art and the artist, and the piece is as much an homage as anything. Here are the original program notes, which I hope to expand on in this post. Resides behind each of the paintings that open the vortex of the Quiet Axis, a sense of immeasurable geometry. The sonic space in this quartet draws inspiration from this symmetry, this fearsome sound and soul full vision. The first movement carves a simple descending line, a series of vectors that rotate and intersect. The lines are (e)motionless, but moving in reference to a stable center. This center –played by violin 2 and viola – can reach inwards to a deep expressiveness, constrained by the enormity of silence that opens up throughout the piece. Strictly numbered, duration is important in this movement. The second movement has the heart of the moment. It is deeply sensible, sensitively peopled. The gentle assurance of the Buddha, Emerson in Concord, Ives at the piano. There is also in each piece a 'Compositional Moment', some outcome of the process, some unexpected improvisation that seems to outrageous, so unexpected yet so completely realized that it demanded a choice: do I keep it, do I stay longer than I can stomach, do I keep this space open...each movement laid bare a choice: this blend of process requires this outcome. And at the end of that decision arises a giggle, disguised as a bilious belch. This composition is for me an exploration of geometry. A geometry inspired, instructed, elicited, elucidated by the paintings themselves. The idea is structural, it is gestural, it is a sense of motion inhabited in the painting. The compositional challenges were first to be graphic – what was the shape I wanted to uncover – and then technical: how to represent that within the operational constraints of four string instruments. The shape of the first movement is of a central foundation – violin 2 and viola – intersected by a long line (violin 1 and cello). The long descending line rotates around the foundation, and all elements move in relationship to each other. This is a series of levers at play pinioned at the start and end note. Each line is soft and sad, but jerky, mechanical. There are accents placed off-kilter, not to make this a syncopated dance number but to keep the sense of mechanization in the playing. I wanted a sound that was melancholy, but melancholy because it is viewed through an intricate machine. This is the sung lament of the puppet, elegant impersonation of sweetness. So lay out this gypsy pole, at a 45 degree angle. Bisected with this, present a foundation of second violin and a husky viola, crossing a central axis and descending equidistant below. The material that forms the center of the spectrum material unfolds in duration, more amorphous, more passionate. My pencil reckoning of the various melodic fragments suggest what form I'm talking about. The duration between the start and end times of each statement of the line increases by Fibonacci. This is not completely accurate, either in design or in implementation. Processional algorithm is not a tyrant in music, and error is an homage to the future. The sketch here shows roughly the middle third of the boxes used to calculate duration shaded boxes represent silence . Each box is set in millimeters, each millimeter representing a 16th note duration. The compositional moment for me writing this piece was the understanding that this process required an increasing amount of silence. This is what it is about. Do I dare to leave the players there for 20 measures of silence? This is also the kinesthetic moment, when I reach into the physical unfolding of the piece, more than the sound or pitch class itself. Would the piece collapse? During rehearsal, I stressed the importance of holding as if about to play, rather than relaxing to the count, introduce a magical element, a theatrical touch. How does it hold up against the actual spectrum? Will an honest depiction of the frequencies present at any given moment show any indication of this abstract structure? Happily, it seems to. Closer examination of this representation shows the opening of space between each gesture - each gesture seen quite clearly as a line of changing scope. So: each movement has a title, and the third is “like a Fist in the face and a Stab in the gut”. In the program notes I explain that this is a reference to the awesome impact, the physicality of the unknown in Lowry's paintings, And this is true. It is Messiaen's angels of the annunciation. The second movement was written like dictation. I have always wished I was the kind of composer who knew with dead certainty what to write, how to start so that it would end this way. A short little movement here, it was as if I took notes with Charles Ives seated next to me. The compositional moment, the instinct to follow, is the extreme simplicity of material. Only but three notes in the whole thing, I recall. Oh, but nothing is ever simple. A few months after finishing this piece, a friend of our family moved away from Pittsburgh, and offered their piano to us. A beautiful instrument, but in such need of repair that I couldn't see a way to take it. A baby grand, owned by Robert Frost's grand daughter and with pr oven provenance that Frost himself played on this instrument. I always write at the piano. A piano touched by Robert Frost, what would that have been? Entering complexity, it would have been like the late night trip I took with Mark to Henry Beston's farm. At this point, I don't know any more what gentle wisdom came from Mark, and which from our readings of Henry. But Mark and I played Poulenc together (the magnificent Sonata for Two pianos from 1953), and in fact we drove his new Honda round the narrow roads near Sabbathday, Maine: such foolish driving, with Poulenc's Stabat Mater blasting from the stereo - a wishful way to die. Henry Beston wrote several books I suppose the most famous is The Outermost House. He also wrote a book called Herbs and The Earth, a rigorous philosophy of attention and connection, transcendentalism. But my favorite is Northern Farm. That book begins with a steam ride up from Boston to his home in Maine, deep winter. I've read the book to my daughter when she was 6, when Spring was coming back to Pittsburgh. But I think of the book and I can feel the air freeze inside my nostrils. We left Bates late one night, Mark knows the daughter, a poet, and we pulled up beside the lake in dark stinging with the distance between where we were and where we had come from. Stars as bright as the echo of memory. The sky our vast unknown self, who am I now remembering this, perhaps I looked upon that young man and his friend with my eyes piercing through the brightest star, that light an arc from where I sit this moment to the point we stood back then. It is a place that still resides within me, a place where life is honest, work is proud and meaning oozes. Lowry described this music as 'Spectral' New England, which I take to be that same deep, rich night in Maine. It is the central part of the quartet, movement 1 is about downward motion, movement 3 is essentially an upward line. Movement 2 is the human heart, cut by geometry. It is Rockwell Kent on a rainy afternoon in the Old Port, roughly 1988. An aging human heart remembers what it was to be alive and young. And recalling that the younger self must surely hold an intimation of that self made old. If the first movement is about the compression of a downward line then this movement is an upward line unfolding. It's an algorithm, and a pretty brutal one. I have a series of chords, perhaps derived from this sketch (maybe insert). I also have the first 7 numbers in the Fibonacci series. The full series, played once, is the desired end state. The initial point is one chord played 21 times. The next step in the algorithm is two 16thnotes, played 13 times. The second note is derived from the full series. I add the note above the initial point to derive two pitches. Each successive step includes notes either above or below the initial step, always to create a pattern that is equal in 16thnotes to the next number in the Fibonacci series. At certain points in the unfolding, I return to the initial state, but will always extend further in the next iteration. Having constructed an unfolding pattern that follows the series of pitches with length of pattern and number of durations derived from fibonacci, I then retrograde that entire process in terms of duration and pitch. At key points, I insert the Note that the original forward unfolding is always dynamically quiet. The second, retrograde process is always marked with a triple forte dynamic. The opening chord is quiet at the start, when it is the beginning of A. But it is Loud at the end, when it is the completion of retrograde material. In rehearsal, Jason the Violist said that the hardest part of the movement was trying to smooth out the edges of the sections. I spoke about this binary structure, and how the piece requires mechanical and abrupt dynamic changes. It was great to watch the quartet churning away, all these close knit clusters in parallel motion. The compositional moment in this piece was to allow disquieting numbers of repetition, as directed by the Fibonacci series. The first component of Sequence A, with 1 pitch, is played 2 times. Component 2, which happens to have 3 16th notes is played 13 times. Then there are repetitions at each of the switch points, which defines the duration of the full statement of Sequence A. The attached sketch looks like I'm working out the points to insert the retrograde (those numbers in parentheses are bar numbers). I'm obviously struggling still with the numerology of each small pattern. The lines within the first movement are bows of gypsy puppets. The second movement lines are stretched as time becomes a measured, measuring memory. This third movement lines are ley, the trauma of the unknown. This is actually my second string quartet. I had a reading of my first, with a recording on some DAT tape – lord, I don't even remember what a DAT tape is anymore. I called the piece 'Carapace', enervated by the opening of Stephen MacGuire's 'Wicked'. He wrote of the witch after her dissolution in Judy's virgin nymphoniacal waters “and all that was left of her was the carapace of her wickedness”. A carapace is the vestigial skeleton of an evolutionary dead end. A remnant – like our sparkling tail, a labyrinthine thread back to the monkey trees – that no longer holds meaning but yet holds form and perhaps a piece of purpose. With a second is implied a third. And this is not an infinite sequence. "We perceive a piece of music that begins, ends, and noodles around in between those points - that is, until we step outside the moment (after the piece is done) and hold the shape as a kinaesthetic experience....Likewise, we see ourselves existing as the result of conditions manifest in this particular moment alone - when instead we are at least a four dimensional object in a singular totality of time that we perceive as a piece birthing, dying, and living in between those points"